Having an accurate clock also helps you stitch two scenes together if you’re using multiple cameras to photograph the same scene. Steve, first let me say I always look forward to your updates, I’ve picked up a lot of helpful tips over the last couple years. Now about camera clocksAnother reason (for some of us) is that an accurate camera clock is imperative when Geotagging pictures out of camera. When I take my Canon SX40 out on the trail I always take my Garmin GPS with me. Later I can load my pics to my hard drive then connect the GPS and GEO Tag the photos in a program from Garmin called Basecamp. It basically matches your recorded route time to the meta-data from the photo and assigns a location to the picture. If the clocks aren’t accurate niether is the location. Until I can afford a nicer camera with GPS, this is a great work around. Just a reminder that DST is in effect in Canada as well, except in Saskatchewan. I believe Arizona does not recognize it either, but there may be some other US states that are not on-board as well. Thanks, Steve. I once again forgot and would have regretted it later. 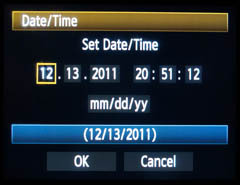 I use the Canon EOS utility, because I have two bodies and that will sync the time for both by setting them to the computer’s time. Now if I can only figure out why my mac no longer automatically starts up the utility when I connect to the USB port. OK, there was a small icon in the bottom left corner of ImageCapture that sets what to do when a camera is detected – it had apparently lost its setting. Fixed. Also, apparently though the utility will set the time on the camera, I needed to manually change the time zone in the menu to DST. Nothing is simple. Thanks for your weekly posts Steve, I read them every week and always find them inspiring. They encourage me to get out there with the camera! Just to add the UK viewpoint on Daylight Saving Time, we put the clocks forward one hour on the last Sunday in March and (confusingly) call this British Summer Time, BST. I’ll check my camera clock and think again about a gps gadget – it’s about time cameras all had these built in! Thanks, Terry! Wow, another country that changes time 🙂 for some reason I always thought only the US did this. I like what they call it in the UK though. We should call it “summer time” here too.